Southern coastal parts of Kerala are well-reported high background radiation areas. Hence, the radiological protection of the population in this region may have some concern. In the present work, samples were collected during three different seasons, namely premonsoon, monsoon, and postmonsoon. The radionuclide activities obtained for various seasons have been compared in order to understand the enrichment of radionuclides during various seasons. The activities of natural radionuclides, namely 40K, 226Ra, and 232Th in sand samples collected from Southern coastal parts of Kerala were determined using NaI (Tl) gamma-ray spectrometer. Sand samples collected during postmonsoon showed enhanced level of radionuclides concentration. The radiation dose to the population was also estimated from the activities of radionuclides in order to assess the radiation levels. The calculated values of risk assessment parameters were within the safe limits, which indicate the radiation exposure to the population due to these radionuclides is insignificant. However, seasonal variation of radionuclides concentration is significant. The results of the present systematic investigation are presented and discussed here in detail. There are a few regions in the world known as high background radiation areas (HBRAs) due to the local geology and geochemical effects that cause enhanced levels of terrestrial radiation. The Southern coastal areas of Kerala, especially Chavara-Neendakara at Kollam district in Kerala, are commonly referred to HBRAs in the world. Kerala coastline has a significant resident population, and it is very dynamic and fluctuates seasonally. Hence, the quantity of placer deposition of heavy minerals also changes which leads to change in the activity of primordial radionuclides. The objective is to study the radiological protection of the population and to understand the seasonal variation of radionuclides concentration in Southern parts of coastal Kerala. The regions, namely Kovalam (S1), Varkala (S2), Neendakara (S3), and Parimanam (S4) from the Southern coastal areas of Kerala, known HBRA, were selected and locations were identified on the basis of visual inspections for heavy mineral accumulation and radiation intensity (scintillometer UR 705). In each region, three samples were collected in one season and average activity was found out. The average activities were denoted as S1 (a), S1 (b), and S1 (c) for premonsoon, monsoon, and postmonsoon, respectively, for Kovalam location and the like for other regions. The sand from the beaches was collected in polythene bags following standard procedure  and brought to the laboratory. Organic material, roots, vegetation pebbles, etc., if present were removed and the samples were initially sun-dried by spreading them in a tray. Samples were later dried in an oven at 110°C for 24 h in order to remove the moisture content completely. These samples were filled in plastic containers. Sample containers were filled with 250–300 g of the samples depending on the density of the sample for uniformity and sealed with adhesive tapes to make them airtight. These sample containers were stored for a period of 1 month before gamma spectrometric analysis so as to allow the establishment of secular equilibrium between 226 Ra,232Th, and their daughter products. Estimation of activities of 40K,226 Ra, and 232Th in the sand samples were carried out using a high-efficiency NaI (Tl) detector. The well-type receptacle NaI (Tl) scintillation assembly provides maximum absorption of radiation from a sample by approximating 4pi geometry. Scintillation assemblies with well-type crystals are most commonly used in environmental monitoring. The scintillation detector of size 5 cm × 5 cm was used along with multichannel analyzer. The spectrometer was calibrated using RG-U, RG-Th, and RG-K, as standard sources. These are standards sources for Uranium, Thorium, and Potassium procured from International Atomic Energy Agency, Vienna. The fullwidth at half maximum was 60.78 keV with resolution 8.46%, for the 137 Cs (661 keV) peak. The detector was shielded with lead blocks of size 6” × 3” × 1.75,” to reduce background counts due to terrestrial gamma-ray radiations. The samples were analyzed with an acquisition time of 40,000 s, using GSPEC software to obtain the gamma-ray spectrum with good statistics. The 226 Ra radionuclide activity in different samples was estimated from 1764 keV (15.9%) gamma peaks of 214 Bi.232Th activity was estimated using 2614 keV (35.8%) gamma transition of 208 Tl.40K radionuclide activity was estimated using 1460.8 keV (10.7%) gamma peak from 40K itself. The simultaneous equation method  was followed to analyze the spectrum and calculate the activity concentration of radionuclides, namely 226Ra, 232Th, and 40K. The simultaneous equations are given below. where C1, C2, and C3 are Compton corrected and background subtracted counts under the photopeaks of 232Th,226 Ra, and 40K, and, T2.61, T1.76, and T1.46 are the total integral counts under photopeaks of 208 Tl,214 Bi, and 40K, respectively. F1= 0.1 and F3= 1.34 are Compton contribution factors. The activity (A) of 226 Ra,232Th, and 40K was estimated using the equation. Where C is the Compton corrected net counts under the photopeak. SD is the standard deviation. E is the photopeak efficiency (%) of the detector and a is the abundance of the characteristic gamma ray. W is the weight of the sample in grams. The absorbed gamma dose rate prevailing at 1 m above the ground level has been measured using a portable survey meter having sensitivity of 1 μRhr −1. The survey meter integrally coupled 1” × 1” NaI (Tl) scintillators to a 1½” photomultiplier tubes to have the optimum performance in counting low-level gamma radiation dose rate. Biological, radiological, and clinical effects are directly related to the absorbed dose rate. In view of this, the absorbed dose rate due to gamma radiations in air at 1 m above the ground level was calculated based on the guidelines provided by the UNSCEAR, 2000. Where D is the absorbed dose rate and CRa, CTh, and Ck are the activities of 226 Ra,232Th, and 40K expressed in Bqkg −1. To estimate the annual effective dose, two important factors have been taken into account (i) the conversion coefficient from the absorbed dose in air to the effective dose and (ii) the indoor occupancy factor. The former gives the equivalent dose in Svy −1 from absorbed dose in air Gyh -1, while the latter gives the fraction of the time the individual is exposed to outdoor radiation. The first factor has been recommended by the UNSCEAR, 2000 as 0.7 Sv/Gy and the second factor as 0.2 (the outdoor occupancy factor), which suggests that there is variation from absorbed dose in air to effective dose received by adults. The annual effective dose is calculated, taking into consideration that people in India, on an average, spend nearly 20% of their time outdoors. The annual effective dose was calculated from the following equation. Radium equivalent is an index that has been introduced to represent the specific activities of 226 Ra,232Th, and 40K by a single quantity. The radium equivalent activity was calculated following the equation. The external exposure index (EEI), due to the emitted gamma rays, from sand samples was calculated using the relation. The internal exposure to radon and its daughter products is quantified by internal exposure index (IEI) which is given by the equation. The activities of 40K,226 Ra, and 232Th in sand samples during different seasons, namely premonsoon, monsoon, and postmonsoon were calculated and given in [Table 1]. Assessment of radiological indicators were also done and discussed in light of literature values. In Kovalam region, activity of 40K is almost similar during premonsoon and postmonsoon. During monsoon, activity of 40K is lower than the other two seasons. In the case of 226 Ra, higher activity was observed during premonsoon. It was noticed that enrichment of 232Th occurs during postmonsoon in Kovalam region. In Varkala, higher activity of 40K was observed during postmonsoon and lower activity was observed during monsoon. In the case of 226 Ra, higher activity was measured during postmonsoon and lower activity was measured during premonsoon. Enhanced level of 232Th was noticed during three different seasons in Varkala region. However, comparing three seasons higher concentration of 232Th was observed during monsoon. In Neendakara region, activity of 40K,226 Ra, and 232Th are not significant during monsoon seasons. Comparatively, higher value of 226 Ra and 232Th was observed during postmonsoon. In the case of Parimanam region, the activity of 40K and 232Th are significant during postmonsoon. Same time, the activity of 226 Ra was not significant during three different seasons. During monsoon, concentration of radionuclides was comparatively low in all the sand samples but slight changes are observed in different selected regions. It may be due to the raising of water level in the sea and prolonged rainfall sweep out sand on the surface of the beaches which leads to the lowering of radionuclides concentration. During natural calamities such as floods and Tsunami, there is a chance to deposits heavy minerals on the beaches and sometimes it may enhance radioactivity level. During premonsoon, water level in the sea was reduced and wave action on the beaches comparatively low. People coming to the beaches for fishing, recreation, etc., leads to the fining and fractioning of sand on the beaches and redistribution of heavy minerals occurs. Hence, the concentration of radionuclides in sand samples during premonsoon is higher than during monsoon. During postmonsoon, beaches have seen more black in color because of high amount of heavy minerals deposited on the beaches. It may due to the net movement of heavy minerals toward the shore zone by the action of strong waves in the sea. It is observed that during postmonsoon, wind speed is high in Kerala coast. The selected beaches are experience irregular wave action because they are not straight beaches. Geological and geochemical conditions, such as temperature, wind, pressure, degree of rock weathering, the disequilibrium state of uranium series inside the solid grain, and adsorption of radionuclides in the rock grain and fracture surfaces of rocks, influence the quantity of radionuclides in sand. Radiological indicators such as absorbed dose, annual effective dose, radium equivalent activity, and external and internal exposure indices are tabulated in [Table 2]. 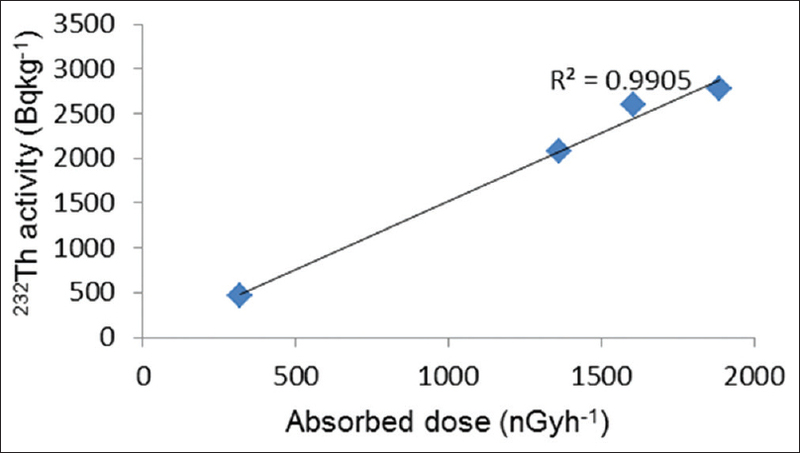 There exists a good correlation between the activity of 232Th and external gamma absorbed dose with correlation coefficient r = 0.99, which is shown in [Figure 1]. It confirms 232Th is the major contributor to the external gamma dose rate in air. [Table 3]. gives absorbed dose and corresponding annual effective dose measured using scintillometer which is also in agreement with agrees the analysis result. 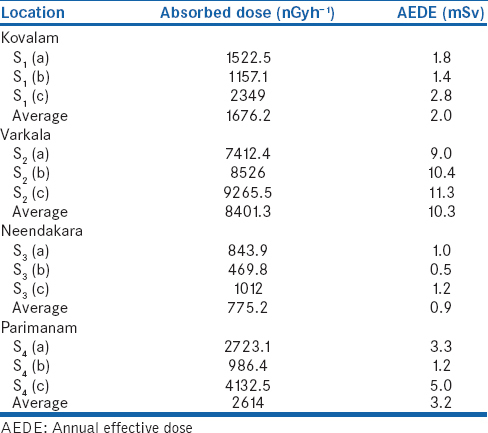 Average value of annual effective dose is high in Varkala region (2.2 mSv) and low in Neendakara region (0.3 mSv), and it has not exceeded the worldwide average value of 2.4 mSv recommended by UNSCEAR (2000). It is observed that people residing along the Kerala coast spend their time about 8–10 h in a day outside the house means in the coastal environment and spend their time about 3650 h/year in this region. Exposure time is one of the important factors which decide whether absorbed dose create any health problem or not. 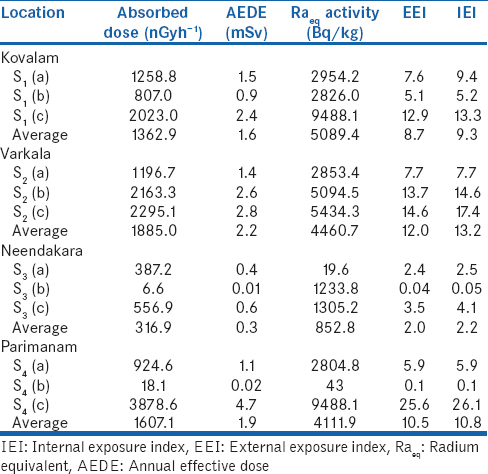 Comparatively, average value of radium equivalent activity is high in samples collected from Kovalam region (5089.4 Bqkg −1) and it is low in samples collected from Neendakara region (852.8 Bqkg −1). The upper limit of radium equivalent activity is 370 Bqkg −1 recommended by UNSCEAR (2000). Average value of EEI and IEI are greater than unity and <13.2. When it exceeding unity, it does not cause any significant exposure which may result in any kind of adverse health effects. To cause any kind of adverse health effects, the index should approximately exceed about a million. Radiological indicators mentioned here are within the safe limits recommended by the UNSCEAR or ICRP. However, radium equivalent activity is above the world average activities (UNSCEAR, 2000). The seasonal variation of radionuclides concentration is significant in most of the samples collected along the region. Significant variations occur in postmonsoon may be due to the large deposition of heavy minerals such as monazite and apatite, on the shore zone. Furthermore, local geology and geochemical effects may be the reason for lower or higher concentration of radionuclides in each sample. The present study shows the radiological indicators were within the safe limits and may not pose significant health hazards to human beings. The first author wishes to acknowledge the Kannur University for providing financial support in terms of Research Fellowship. 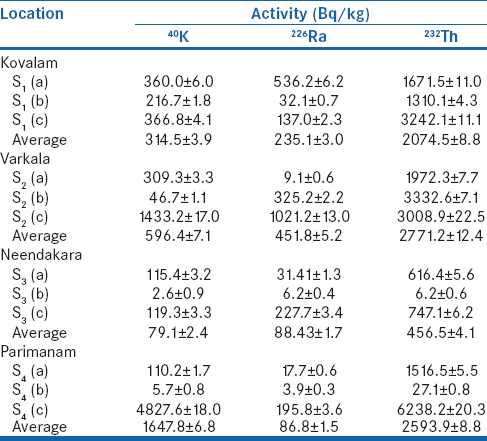 Derin MT, Vijayagopal P, Venkatraman B, Chaubey RC, Gopinathan A. Radionuclides and radiation indices of high background radiation area in Chavara-Neendakara placer deposits (Kerala, India). PLoS One 2012;7:e50468. Volchock LH, de Planque G, editor. EML Procedure Manual. Environmental Measurement Laboratory. 26th ed. New York; 1983. Alnour IA, Wagiran H, Ibrahim N, Laili Z, Omar M, Hamzah S, et al. Natural radioactivity measurements in the granite rock of quarry sites, Johor, Malaysia. Radiat Phys Chem 2012;81:1842. Venunathan N, Kaliprasad CS, Narayana Y. Natural radioactivity in sediments and river bank soil of Kallada River of Kerala, South India and associated radiological risk. Radiat Prot Dosimetry 2016;171:271-6. IAEA/RCA. Regional Workshop on Environmental Sampling and Measurement of Radioactivity for Monitory purpose. Kalpakkam: IAEA/RCA; 1989. p. 85-92. United Nations Scientific Committee on the effects of Atomic Radiation. Sources Effects and Risks of Ionizing Radiation Report to the General Assembly, United Nations. New York, USA: United Nations Scientific Committee on the effects of Atomic Radiation; 2000. Beretka J, Matthew PJ. Natural radioactivity of Australian building materials, industrial wastes and by-products. Health Phys 1985;48:87-95. Rao DD. Use of hazard index parameters for measurement of radioactivity in soil: A view of change. Radiat Prot Environ 2018;41:59-60. Krieger R. Radioactivity of construction materials. Betonwerk Fertigteil Tech 1981;47:468. Al-Saleh FS, Al-Berzan B. Measurements of natural radioactivity in some kinds of marble and granite used in Riyadh region. J Nucl Radiat Phys 2007;2:25-36.
International Commission on Radiological Protection. Recommendations of the International Commission on Radiological Protection. Publication No. 60. Vol. 21. Oxford: Annual Pergamon Press; 1991. p. 1-3.